The NanoTrader’s compound symbol editor is a unique analytical tool. 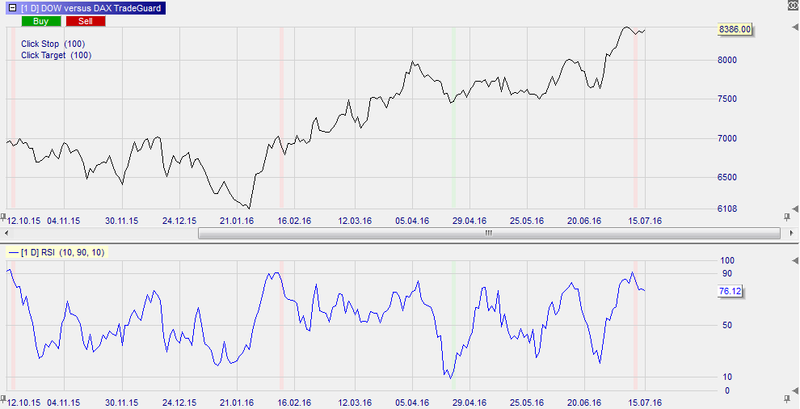 It allows the trader to visualize relationships and correlations between two or more financial instruments. The price of a basket of stocks, the gold price in Euro, the relationship between the Dow and the Dax ... they can all be visualized using the chart of a compound symbol. Define your own compound symbol (e.g. gold price in EUR instead of USD). Get a real-time chart of every compound symbol. The most popular use for compound symbols is pairs trading. Pairs trading is a trading strategy which tries to generate profits based on low risk trades. Long-short trading is another name for pairs trading because each trade consists of a related long and short position. The trader does not trade a direction, but a correlation which is less risky. The two positions can both be stocks or a stock and a market index or a sector index. The chart above shows the compound symbol (DOW minus DAX). The trader added an RSI indicator below. The indicator gives the following information: if the value of the RSI is low, it means that the DOW and the DAX are coming closer together. Reversely, if the RSI is high, the DOW and the DAX are moving apart. In this scenario the trader would expect the two indices to come more closely together again. In other words he would short sell the DOW and buy the DAX. This is a typical pairs trading strategy. If you are a trader with base currency in, say, EUR, and you trade gold, which is quoted in USD, your real profit or loss depends on the evolution of the gold price and on the evolution of the EUR/USD. This trader created a compound symbol (gold divided by EUR/USD) which shows the gold price in EUR so he can see in real-time the result of his gold position. The NanoTrader’s compound symbol editor allows traders to create a symbol based on a basket of stocks. This allows the trader to see the combined result, do technical analysis on the basket and get buy and sell signals for the basket as a whole. The compound symbol editor is intuitive. Traders can drag and drop instruments from the instrument list, type the relationship formula (there is a nifty tester to see you made no errors) and save. All without programming.